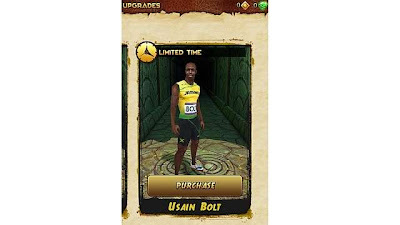 Imangi Studios, the publisher of Temple Run 2 has just made your running experience more realistic with a special edition Usain Bolt In App upgrade iOS devices. For the uninitiated the Temple Run game is a very popular Android and iOS game which involves running your way to success. The game has topped 170 million downloads and counting. Now back to our story. The special upgrade version lets you don the avatar of Usain Bolt for a change and as Usain Bolt you have run your way through steep cliffs, mines, zip lines and forests. The special edition updated app, numbering v1.4 allows you to run as Usain Bolt, who we all know is the fastest man on earth as of today. 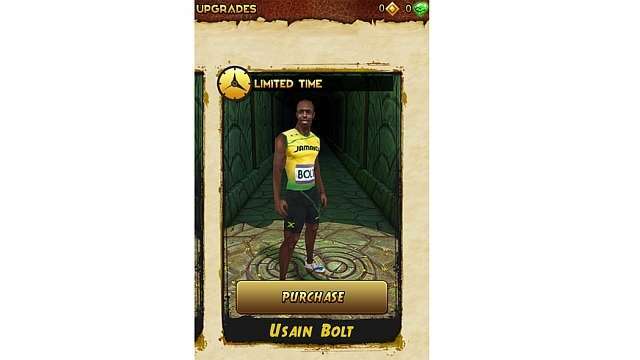 But to enable the Usain Bolt avatar you have to pay $0.99 (Rs.55.00) through in App purchase. Running as Bolt you get a special 'Bolt Powerup'. However remember there are limited Usain Bolt avatars on sale, so by the time you are reading this they may get sold. 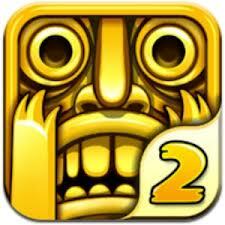 Download the updated Temple Run 2 for your iOS devices from Apple Store. Android users can also update their Temple Run 2 from Google Play here.